We’d love your help. 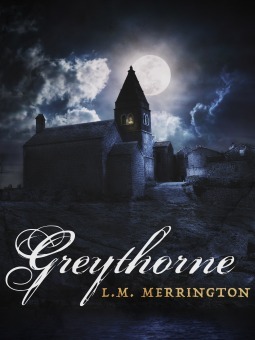 Let us know what’s wrong with this preview of Greythorne by L.M. Merrington. How did Lucy Greythorne die? From the moment Nell Featherstone arrives at Greythorne Manor as a governess to eight-year-old Sophie, she finds herself haunted by the fate of the mistress of the house, and entranced by the child's father, the enigmatic Professor Nathaniel Greythorne. When a violent storm reveals Lucy's body is not in her grave, Nell becomes suspicious about th How did Lucy Greythorne die? When a violent storm reveals Lucy's body is not in her grave, Nell becomes suspicious about the Professor's research. But what she discovers in his laboratory will turn all her ideas about life and death, morality and creation on their head. Enthralled by a man walking a fine line between passion and madness, Nell must make an impossible choice between life, death, and life after death, where any mistake could be her last. To ask other readers questions about Greythorne, please sign up. I perused my TBR for something that would fill be seasonal wish for a title gothic or spooky in tone. "Greythorne" was the result of my search. I requested it from NetGalley quite a while ago, for just such an occasion. It reminded me greatly of one of my favorite novels, "Jane Eyre", in that it was set in roughly the same time period and featured a governess sent to a gothic mansion to tutor a little girl. Only this time the house was situated on an island which was isolated, windswept, and wild I perused my TBR for something that would fill be seasonal wish for a title gothic or spooky in tone. "Greythorne" was the result of my search. I requested it from NetGalley quite a while ago, for just such an occasion. It reminded me greatly of one of my favorite novels, "Jane Eyre", in that it was set in roughly the same time period and featured a governess sent to a gothic mansion to tutor a little girl. Only this time the house was situated on an island which was isolated, windswept, and wild. The huge building's only staff was a lone man called Jonas. He did all the maintenance, cooking, and ferrying of items to and from the island. So, after Nell comes to live at Greythorne there are only four people in the house altogether! Although the house is vast in size, the atmosphere is almost claustrophobic. Ominously, the people in the nearest village on the mainland have warned Nell Featherstone to abandon her plan of taking up a position there. Greythorne is a foreboding stone manor complete with crenelated towers and of course... secret passages. Sophie, the little girl, who is eight years old, seems wise beyond her years. She has led an almost solitary life and reads voraciously. Her social skills are abhorrent though, and she resents the fact that her father hired a governess which she feels she does not need. The little girl is plagued with nightmares, and seems increasingly listless and unwell. Nell Featherstone, the governess, age eighteen, is alone in the world, without any family at all. She hopes that she will find a home in Greythorne. She is pleased by her accommodation there and looks forward to teaching her small charge. The house begins to exert a hold over Nell. As much as she longs to escape the island and converse with other adults, she feels a connection to the place that is now her home. She frequents the beautiful two story library that is a treasure-trove of the books she covets. The book's narration is perfectly in keeping with the time period in which it is set. The descriptive passages are very well rendered. One of my favorite lines from the novel is this one in which Nell enters the library: "It was bathed in sunlight from the enormous windows; shafts of it slanted through the dusty air, creating sparkling, ethereal roads leading skyward." Five years previously, the lady of the house, Lucy Greythorne died mysteriously. Sophie's father, Nathaniel Greythorne, is a scientist. He conducts 'experiments' at the manor which are highly secretive. Ever since Charlotte Brontë penned Jane Eyre, novels have featured inexperienced governesses in creepy isolated mansions encountering unspeakable things that go bump in the night. Greythorne, a debut book by Australian L.M. Merrington, continues that proud tradition. Orphaned Nell Featherstone, fresh from the Brookvale Girls Home, assumes her first posting as a governess at Greythorne Manor, a crumbling stone mansion — complete with tower, a taciturn and mysterious underling, and an unsavory repu Ever since Charlotte Brontë penned Jane Eyre, novels have featured inexperienced governesses in creepy isolated mansions encountering unspeakable things that go bump in the night. Greythorne, a debut book by Australian L.M. Merrington, continues that proud tradition. Orphaned Nell Featherstone, fresh from the Brookvale Girls Home, assumes her first posting as a governess at Greythorne Manor, a crumbling stone mansion — complete with tower, a taciturn and mysterious underling, and an unsavory reputation — on a tiny island off the English country coast. Her employer, the charming and handsome Professor Nathaniel Greythorne, wishes for a steadying influence on his wild but clever 8-year-old daughter Sophie, whose mother died when the girl was but 3. To tell you any more would be to spoil the novel, but just let me add that I never guessed the conclusion — not really. Please let me allay your fears: Although the device of the fresh-faced but intrepid governess in the spooky house sometimes descends into cliché and predictability, Merrington exhibits writing chops that would make an established writer proud. Like This House is Haunted, The Turn of the Screw, and, yes, Jane Eyre, Greythorne will keep readers enthusiastically turning pages until the very last one. Highly recommended. 4.5 stars - Simply put...I liked this. I first saw the cover and decided I wanted to read it. For me, this was a classic gothic tale, very atmospheric with smooth prose. I didn't realize that it was a first book for the author until I finished it and was reading the credits, kudos to Ms. Merrington. Although it is a short story, and I did figure out most of it, I was still hit with a couple of surprises. I think most would be. I will certainly be looking for more by this author in the future. **Tha 4.5 stars - Simply put...I liked this. I first saw the cover and decided I wanted to read it. Ein gelungenes Debüt und sehr empfehlenswert für Leser von klassischen Schauergeschichten! I really enjoyed this atmospheric novella Gothic tale about a governess employed by a Professor to teach his young daughter. This is a completely new author to me and I love finding Australian Indie authors to read. The setting was haunting with the huge Manor located on a rocky isle that can only be reached by boat, and Nell, having been employed for her first job, is unsure of what to make of the local villager's gossip. While part of the ending was easy to see the final shocks were not, with th I really enjoyed this atmospheric novella Gothic tale about a governess employed by a Professor to teach his young daughter. This is a completely new author to me and I love finding Australian Indie authors to read. While part of the ending was easy to see the final shocks were not, with the author doing an amazing job of the delivery of horror through the heightening of tension and anxiety. I only wish it had gone on with a longer Epilogue! I really enjoyed this. The writing style made it a pleasure to read. I found myself a few times thinking I knew what was happening next,I mean we've all read stories about orphans who go to become a governess for a enigmatic widow, and tame his unruly child. Add to that the setting, the place nobody ever goes, which cannot be accessed easily... all very atmospheric. When the twists and turns came, they kept me reading right up to the last page, as quick as I could. There were some surprises I didn't I really enjoyed this. The writing style made it a pleasure to read. There were some surprises I didn't see coming, and its not often you can say that these days. Jane Eyre meets Frankenstein, perfect read for the upcoming Halloween time. A very diverting gothic mystery that kept me turning the pages. I enjoyed the atmospheric setting and the surprise twist. I wish it would have been a little longer though. Despite the overused plot of a governess stuck in a haunted house, I did enjoy this book. I love gothic ficton, and “Greythorne” is an excellent addition to the genre. I saw most of the twists coming, but that didn’t take away from the plot, or how much I enjoyed the book. A gothic novel that feels a little derivative and constructed. Nell Featherstone, age 18, grew up in Brookvale Girls Home after her parents passed away leaving her with no living family. Now, she has accepted a position as Governess to eight-year-old, Sophie, daughter of Professor Nathaniel Greythorne of Greythorne Manor. Sophie’s mother, Lucy, passed away five years ago. When Nell arrives in the town of Grimly, she finds it filled with kind people who all warn and advise her to not continue on to Greythorne Manor for it is a bleak place rumored to have ver Nell Featherstone, age 18, grew up in Brookvale Girls Home after her parents passed away leaving her with no living family. Now, she has accepted a position as Governess to eight-year-old, Sophie, daughter of Professor Nathaniel Greythorne of Greythorne Manor. Sophie’s mother, Lucy, passed away five years ago. When Nell arrives in the town of Grimly, she finds it filled with kind people who all warn and advise her to not continue on to Greythorne Manor for it is a bleak place rumored to have very bad things going on there. But this is Nell’s first job and she feels she needs to fulfill her promise to take the job and is reluctant to return in fear to the Girls Home. Reaching the Manor is rather treacherous as it sits atop a steep cliff facing the sea and the only way to reach it is via a small dinghy over choppy waters. Jonas is a grumpy man who is the jack-of-all-trades at the Manor for everything, i.e., cooking, cleaning, etc, and he is the one to row her over. Greythorne Manor is enormous, built of grey stone and quite eerie looking. Nell is happy to meet Sophie who appears to be an intelligent young girl who loves to run freely around the island. However, she is pale and does not appear to be in the best of health. They settle in well and begin lessons. Sophie has a few nights of nightmares and she takes medicine every night and Nell doesn’t understand what it is for. When Nell meets the Professor, he appears to be a congenial man and quite intelligent. Many times he requests that Nell dine with him and he is taken with her own intelligence. He tells her that his specialties are biology and anatomy. He does admit that after his wife died, his finances dwindled which is why Jonas does it all. Nell and Sophie become close and as some time passes, they both wish that they could leave the island for a day to go visit with people in Grimly but the Professor is adamant that Sophie not leave the island. He has also told Nell that she is only allowed in certain rooms of the house. Even though he has told her not to explore, Nell learns more about the house by touring around it with Sophie and she is amazed at the secret passageways and enormous size of the house. But some things happen that make Nell suspicious that the Professor is doing something very strange in his laboratory down in the cellars. When Nell’s curiosity overtakes her fears, she sneaks down to the laboratory one night and what she sees horrifies her. She realizes that she and Sophie are in grave danger and must escape. But how? A governess, a young child, and a spooky house on an island. What secrets lie in this house, what is Sophie's father up to in the dead of the night and what really happened to his wife Lucy? A fantastic cover which really draws the reader in and if I came across it in a bookshop would certainly pick it up for a closer look. The description of the island and how difficult it is to reach it are very vivid and easy to imagine. I like Gothic tales and this fitted the bill nice Three and a half stars. This being October, I found myself looking for something dark and spooky to read in honor of one of my favorite holidays, Halloween. I received Greythorne for free from Netgalley in exchange for an honest review, and it turned out to be the perfect read. The story begins as most gothic Victorian-era tales do: Governess arrives at creepy manor home after being warned not to go, weird circumstances ensue and governess must figure out what's truly going on. Greythorne's governess is Nell Featherstone This being October, I found myself looking for something dark and spooky to read in honor of one of my favorite holidays, Halloween. I received Greythorne for free from Netgalley in exchange for an honest review, and it turned out to be the perfect read. Greythorne's governess is Nell Featherstone, who is warned before she ever steps foot off the train in a small English town to stay away from Greythorne Manor. She is told the professor is a recluse and that strange things go on there, although none of them can really give her specifics. Nell is wary, but, of course, has a job to do. So, she braves the boat ride across the sea to the great house which is set upon its own island. There Nell finds a house devoid of servants to run it, with the only people living there her being her employer, his eight-year-old daughter, and his gruff assistant. Despite the drafty quiet of the house and the oddity of no servants to run it, things seem normal at first, and Nell settles in to teach her new charge, Sophie. Things begin to change, however, as Sophie strangely becomes more and more wan and withdrawn, the professor's demeanor begins to change for the worst and strange circumstances surrounding the death of Sophie's mother begin coming to light. Of course, I thought I had everything figured out before I was even halfway through the book, and was pleasantly surprised when a few nice twists and turns reversed that, keeping me up reading until all hours of the night. From the moment Nell Featherstone arrives at Greythorne Manor as a governess to eight-year-old Sophie, she finds herself haunted by the fate of the mistress of the house, and entranced by the child's father, the enigmatic Professor Nathaniel Greythorne. When a violent storm reveals Lucy's body is not in her grave, Nell becomes suspicious about the Professor's research. But what she discovers in his laboratory will turn all her ideas about life and death, morality and creation on their head. Greythorne is a classic gothic tale with a surprising twist. Nell Featherstone is an educated young woman, but without means. She jumps at the opportunity to work at Greystone Manor as governess. At her arrival, the village folk warn her of the strange and sinister goings on at the manor. Since the death of its mistress, Greythorne Manor has been a cold and empty place. Accessible only by boat, its only residents are the mercurial and enigmatic Professor Greythorne, his daughter Sophie, and his Greythorne is a classic gothic tale with a surprising twist. Nell Featherstone is an educated young woman, but without means. She jumps at the opportunity to work at Greystone Manor as governess. At her arrival, the village folk warn her of the strange and sinister goings on at the manor. Since the death of its mistress, Greythorne Manor has been a cold and empty place. Accessible only by boat, its only residents are the mercurial and enigmatic Professor Greythorne, his daughter Sophie, and his assistant. At first, she finds the handsome professor charming. But he is secretive as to the nature of his experiments, and Nell begins to have doubts. Neither she nor her ward are allowed to leave the island, and Sophie complains of nightly terrors. When Nell discovers that Lucy Greythorne's body is not in her grave, she realizes that nothing is as it seems. I received a copy of Greythorne from the publisher and Netgalley.com in exchange for an honest review. This book is written in a traditional, creepy, Gothic style that I have always enjoyed. The author did a good job of setting a remote location where one expects something frightening to happen from the very beginning. I actually thought it had a slight Frankenstein feel to it, and I liked that. The characters were mysterious and made you want to know more about them, especially the jack-of-all-trades man that worked for the owner of Greythorne. I turned pages quickly i First of all--great cover! I turned pages quickly in this book, eager to know what was going to happen next. There were parts of this book that I thought were very original, although I did feel that some spots could have been filled in a bit more. Overall, this was an enjoyable book with great atmosphere and good dialogue. If you like darker books, this one should satisfy. I received this book from NetGalley and Momentum Books in exchange for an honest review. I was torn between giving this 2 or 3 stars. I am very surprised by the 4 and 5 star ratings this book is getting, as I do not give such high ratings so readily. I was immediately intrigued by the cover, and then when I read the synopsis, it seemed like it was something right up my alley. However, I felt that the story seemed to move along at a very slow pace, despite it being such a short book. There was so m I received this book from NetGalley and Momentum Books in exchange for an honest review. I was immediately intrigued by the cover, and then when I read the synopsis, it seemed like it was something right up my alley. However, I felt that the story seemed to move along at a very slow pace, despite it being such a short book. There was so much time spent on how Nell cared for Sophie and what they studied and their explorations around the island that I found myself thinking "get on with it!". In the last 50 or so pages, the story picked up and you found out what was really going on at Greythorne. This is a short book in the classic Gothic horror style. I very much enjoyed the suspense and buildup of tension throughout the story - I couldn't put it down! I thought the characterisation was mostly well planned out, although the transition from Sophie as a recalcitrant, sullen child to a mild mannered, beautiful prodigy needed work. Additionally, the beginning needed to occurr with a bit more speed and the ending needed to be extended out. It felt rather squashed in, and given how important This is a short book in the classic Gothic horror style. I very much enjoyed the suspense and buildup of tension throughout the story - I couldn't put it down! I thought the characterisation was mostly well planned out, although the transition from Sophie as a recalcitrant, sullen child to a mild mannered, beautiful prodigy needed work. Additionally, the beginning needed to occurr with a bit more speed and the ending needed to be extended out. It felt rather squashed in, and given how important it was - a little more story wouldn't have gone amiss. I asked to review this book from Net Galley, because of the cover to start with, I just fell for the cover, so intriguing. The book was not disappointing, I thoroughly enjoyed. I fell for Nell, I cannot imagine being in her position. I read this in a sitting simply because I wanted to know what was going on, I thought I had worked it out too, was close but not quite. I will be looking for more from this author. I would highly recommend this to everyone who wants a solidly, good read. Would have be I asked to review this book from Net Galley, because of the cover to start with, I just fell for the cover, so intriguing. Reading a debut in the genre you enjoy? They are a slice of life's pleasures when they grab you and demand your sigh of contentment when you finish your read. Greythorne will do this to you. L. M. Merrington's writing is such a comfortable read, the tension she brings you while your reading is supreme. I really enjoyed this gothic horror story..with shades of Jane Eyre and Frankenstein . Nell arrives at Greythorne an isolated mansion to be the new governess. The mystery unfolds bit by bit and I did not guess the twist. the characters are well written and the description of the mansion are creepy and haunting. .
An interesting twist on the governess in a strange environment concept. The tension built well and I really enjoyed the ending. I disliked the change of tense in the epilogue, and I'd really like to see a book of what happens next. I'm sorry to say I found this book very dreary. There was nothing original or exciting about it. Even the climax fell flat. The characters were very one sided and there was nothing to like about any of them. Beautyful cover, and a wonderful story. I love these sort of stories. L.M. Merrington is an author, freelance writer and consultant. Her books include two Gothic mysteries, Greythorne and The Iron Line, and a non-fiction communications handbook, Communications for Volunteers: Low-Cost Strategies for Community Groups. She lives in Australia with her husband Tristan. For more information visit www.lmmerrington.com, or follow her on Facebook.